Have you found a used rv that you want to buy? We can finance it for you. Simply fill out our online used rv loan application and we will go to work. Why apply for a used rv loan with UsedRVLoans.com? That's simple...we can provide you with the lowest available rates and the best loan terms in the industry. No matter what type of RV you want to buy, whether it is a Diesel Pusher, Gas Motorhome, 5th Wheel Trailer, Travel Trailer, etc, we will get you the best rate and term that you will find. We have been in the used rv loan business on the Internet since 1998, and have developed relationships with all of the major banks in the rv loan industry, so we know exactly which banks are looking to loan money on specific RVs, loan amounts, requested terms, etc. If you already own an RV and would just like to lower your interest rate by refinancing your current rv loan, no problem, we can do that too. We may be able to save you thousands of dollars on your current loan, so give us a try, what do you have to lose? 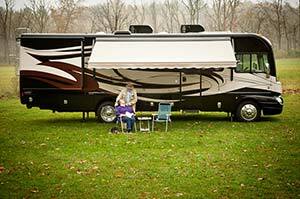 Click Here to refinance your current RV. We do not charge a fee until you have accepted the loan approval and have decided to continue with the loan. Our fee is very reasonable and is worked into the loan, so you have no out of pocket expense. All of our online rv loan applications are secure, so your personal information is safe. If you ever have any concerns or questions, please give us a call toll-free at 1-888-929-4424. Remember, no one can give you an actual quote without having the lending bank review your credit profile. You may receive a quote but the actual rate you receive may end up being higher. Our rates are posted daily on our site and you are welcome to call our toll-free number 888-929-4424, and someone will be glad to tell you about what interest rate your loan will probably receive. It depends on your whole credit profile, and also the unit you are purchasing, how old it is and how much you want to finance. Give us a call, or fill out our secure application, and let us show you just how easy and hassle free financing with us really is! Thanks for your business! We will do our best to make you a satisfied customer as we have done for so many others. Copyright © 2019 usedrvloans.com. All Rights Reserved.